Downtown Chapel Hill is filled with vibrant public art that serves as cultural fixtures in our community. Listed below are 6 examples of public art that makes the downtown area come alive in colors, figures and designs. An eye-catching sculpture located at 140 West Plaza adds to the downtown area’s appeal. This sculpture grabs the viewer’s attention with mist and lights, making every interaction unique for all. Downtown Chapel Hill has over 20 hand-painted murals, almost all by local artists Michael Brown and Scott Nurkin, and many with the help of children in the community. Some murals are tucked in alley ways while others are sprawled across vast building walls; collectively they have helped define a distinctive character that belongs only to downtown Chapel Hill. Discover the murals in an afternoon through Chapel Hill Recorder’s Walking Tour. These designer crosswalks are part of an initiative to increase visibility between people who walk and people who drive. The three crosswalks were all designed by local artists such as Mary Carter Taub and Lope Max Diaz. Located at the Rosemary and Henderson Street Intersection, the Cameron Avenue and Wilson Street Intersection (entrance to Granville Towers), and near Shortbread Lofts. This unique sculpture is part of Chapel Hill’s Sculpture Visions 2016-2017. 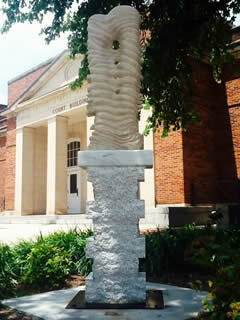 It is made of limestone and located at Roberson Apartments. Expertly designed, this ten-foot tall sculpture is made of steel and painted with vibrant colors. Find Jubran’s design at the Hargraves Community Center. Alexander’s sculpture was awarded an Honorarium for Chapel Hill NC’s Annual Juried Outdoor Sculpture Visions Exhibit in 2014. This sculpture is easy to spot on Franklin Street at the Peace & Justice Plaza.